There are some foods that you have to promise yourself you won’t make often because they are so good, so rich, so indulgent, and so tantalizing that you would be in major trouble if you ate them with any frequency. 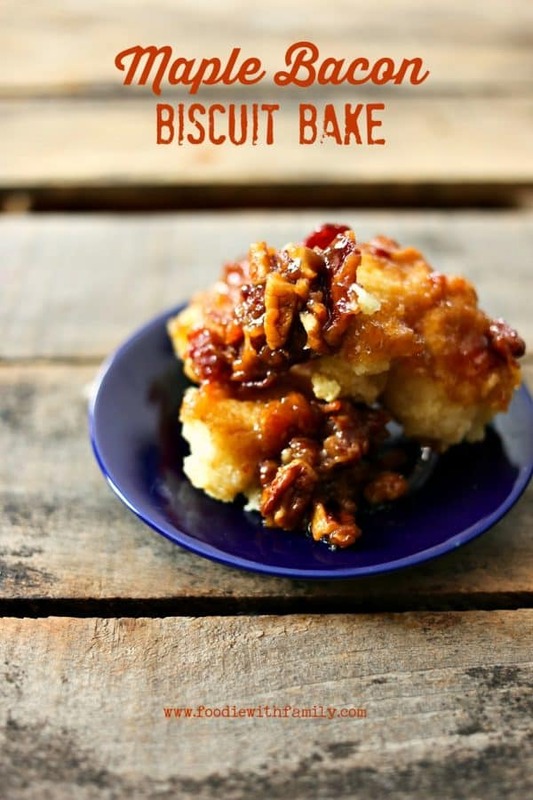 Maple Bacon Biscuit Bake is one of those recipes. Because it is high maple sugaring season in this part of the country, I spent a while perusing the King Arthur Flour website for recipes using maple syrup. 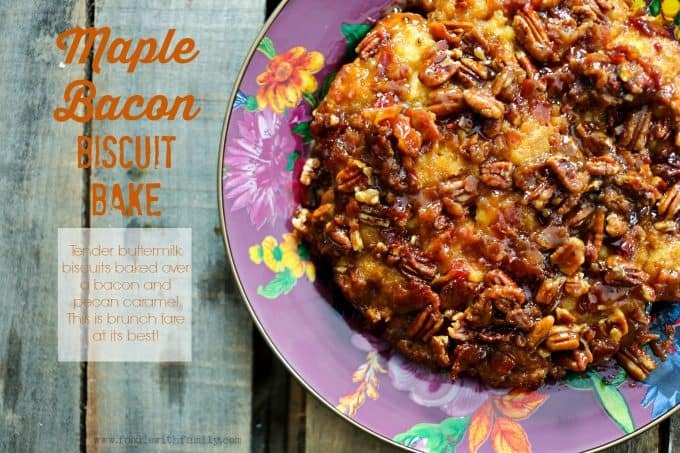 I stumbled upon their Maple Bacon Biscuit Bake and gasped. 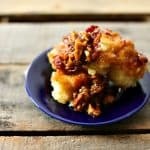 What I was seeing was tender buttermilk biscuits baked over a sticky, rich maple syrup, bacon, and pecan topping. When baked through, the plate was inverted and the gooey syrup ran over and around all of the beautiful biscuits. As if by divine sign, five minutes later, I saw that my friend Carrie had made a version of that same dish and included pecans. That it was being made in my kitchen that day was a foregone conclusion. He’s right, folks, but Easter is coming, and a brunch must be had, and I’m pretty certain Maple Bacon Biscuit Bake is going to be absolutely amazing next to a baked ham. I chose to use round cake pans because -as lame as this reason is- I really wanted to turn the Maple Bacon Biscuit Bake out onto a round plate for visual reasons. If you don’t have round cake pans that are at least 8-inches in diameter and at least 2-inches deep (to prevent caramel bubbling over the edge and smoking in your oven), you can definitely bake it in an 8-inch by 8-inch square pan, again making sure it is at least 2-inches deep. If you’d like to ensure that your goodies come out of your pan clean, line the bottom of the greased pan with a piece of parchment cut to fit the pan. This is note strictly necessary, but the sticky stuff does have a tendency to, er, stick, and parchment helps mitigate that. Please do not cook your bacon to crisp for the Maple Bacon Biscuit Bake. Remember that it will continue cooking in a very high temperature oven and that could carbonize your lovely, crunchy meat candy which would be very sad indeed. Take the bacon to the chewy stage, but not beyond. I say this as a card-carrying member of the “I Prefer Bacon Crispy Club”. To minimize hands-on time, you can cook the bacon ahead of time and reserve the amount of bacon fat needed for the caramel up to two days ahead of time. If you do opt to do this, please melt the bacon fat along with the butter before stirring into the maple syrup sugar mixture. If you can lay your hands on it, DO use Grade B DARK maple syrup for the Maple Bacon Biscuit Bake. It’s the Cadillac of the maple syrup world, even though it seems counterintuitive, because who doesn’t love Grade A, right? Grade A is lighter in colour and packs less maple punch. I prefer Grade B in every single application I can conceive of to use maple syrup, and I can think of plenty of uses. Related: Don’t use “pancake syrup” for this. It just won’t cut it. Seriously. I used cultured buttermilk for this recipe. If you don’t have it on hand, you can add a teaspoon of cider or white vinegar to a measuring cup and fill to the 1 cup mark with milk. Stir well and let sit at room temperature for 10 minutes before using. While this is NOT the same thing, and cultured buttermilk improves the texture of the final product (in my opinion), this acidified milk will lend the same tang to the final product. If, perchance, you’re not a fan of pecans, omit them. Personally, I think the added buttery crunch of the pecans pairs perfectly with the maple bacon caramel, but the Maple Bacon Biscuit Bake won’t suffer structurally if you leave them out. I know it sounds crazy to cook it for just 10 minutes, then leave the oven door shut for another 10 minutes before taking it out and turning it onto a plate, but DO IT. Do not let your impatience get the best of you here. You will be tempted because it will smell so good you’ll want to gnaw your own leg off below the ankle, but stand strong. Heh. Sorry. I mean, stay strong and resist. You will be happy you did. That last 10 minutes with the oven door shut finishes baking your biscuits and making your maple bacon syrup sticky and luscious. Adapted from and with thanks to King Arthur Flour and Bakeaholic Mama. Lightly grease an 8 or 9 inch round cake pan or 8x8-inch square baking dish. If desired, line the bottom of the pan with a piece of parchment cut to fit. Set aside. Stir together the baco pieces, brown sugar, all-purpose flour, maple syrup, pecan pieces, melted butter and bacon fat, cinnamon, and nutmeg in a mixing bowl until even. Scrape into the prepared baking dish or cake pan and spread evenly over the bottom of the pan. In a separate mixing bowl, use a fork or whisk to combine the flour, baking powder, and salt until even. Cut the butter into small pieces and work in with two knives, a pastry blender, or your hands until the butter is in pea sized pieces and completely dispersed through the flour. Pour in the buttermilk or acidified milk all at once and stir with a sturdy mixing spoon just until moistened through and no dry pockets remain. Use a small cookie scoop to drop the biscuit dough over the surface of the bacon mixture. If you don't have a scoop, drop heaping tablespoons of the dough over the bacon mixture. Bake for 10 minutes, shut the heat off, and leave the oven door shut for an additional 10 minutes. Remove the pan from the oven, run a flexible heat-proof spatula or knife around the edge of the pan. Lay a plate or serving platter over the pan and carefully invert. Lift the pan up from the serving dish and the bacon caramel should run over the biscuits. Serve while still warm. THIS! This is amazing! I need this in my life asap. I will be making this one day this week. Yum! Absolutely mouthwatering! Will be definitely trying this amazing recipe! This looks absolutely delicious. Will definitely be making soon. Also, just a small note: when making your own buttermilk, you generally add one tablespoon (not teaspoon) of vinegar per cup of milk. Thanks for the recipe! Okay, this is dangerous! I have made it twice already! I barely got a taste of the first batch, it was devoured so quickly. On the second batch I actually added a bit if cayenne to the bacon mixture, just for a bit of ‘kick’, and it, too, was DELISH! 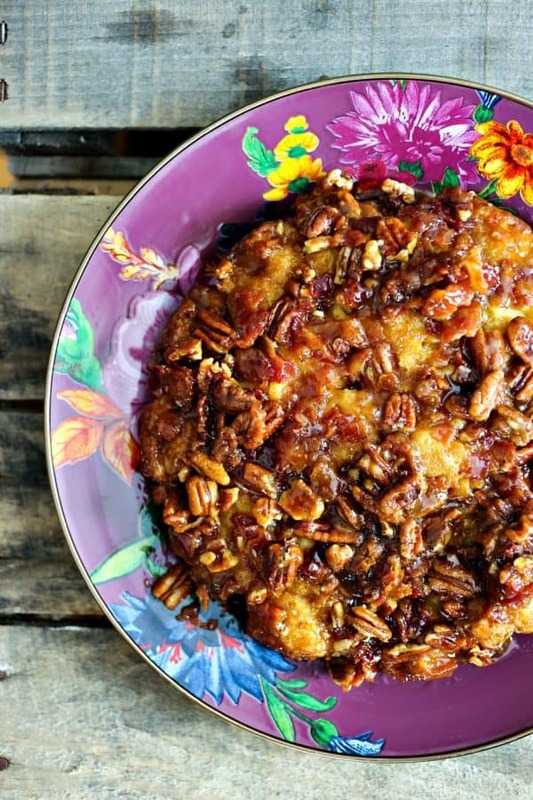 Thanks for sharing….I believe after Easter brunch, this recipe will be hidden away for a bit! Help. I did something wrong, as the bacon syrup was not “sticky and luscious.” It never ran down the sides of the biscuits. It just sat on the top, all hard. The only thing I did differently than what the recipe called for is that I made the bacon syrup the day before, spread it in the parchment lined pan and refrigerated until the next morning when I made the biscuit batter and added it. I did not allow the pan to come to room temperature and I am thinking that perhaps that is what ruined my bacon syrup. What do you think? Was that my undoing or could something else have led to this utter disappointment?